in the life that we shared. In exchange I gave you heat. to grasp at fallen leaves. we have outgrown each other. 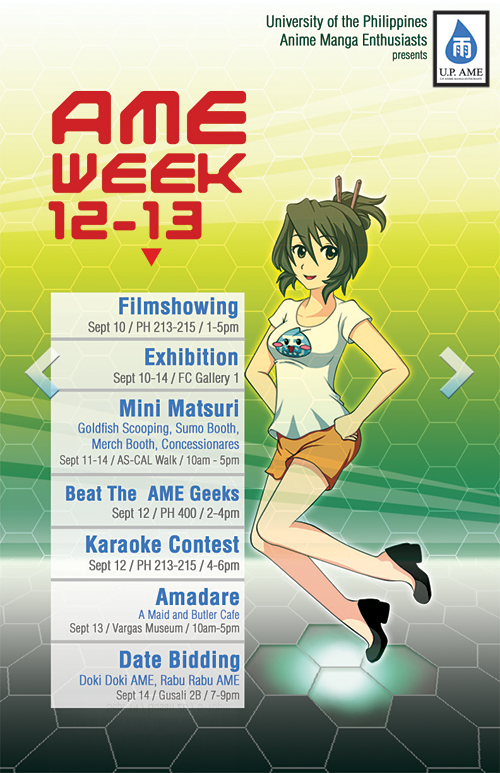 What AME week celebration wouldn't be complete without its traditional mini-matsuri? 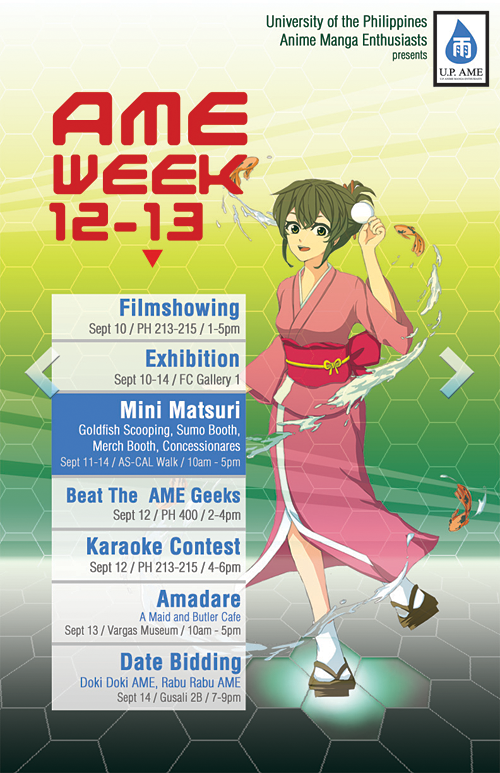 By taking on common elements from traditional Japanese festivals such as goldfish scooping, sumo booths and various concessionaires, AME hopes to bring you a little taste of Japanese culture for one fun afternoon. 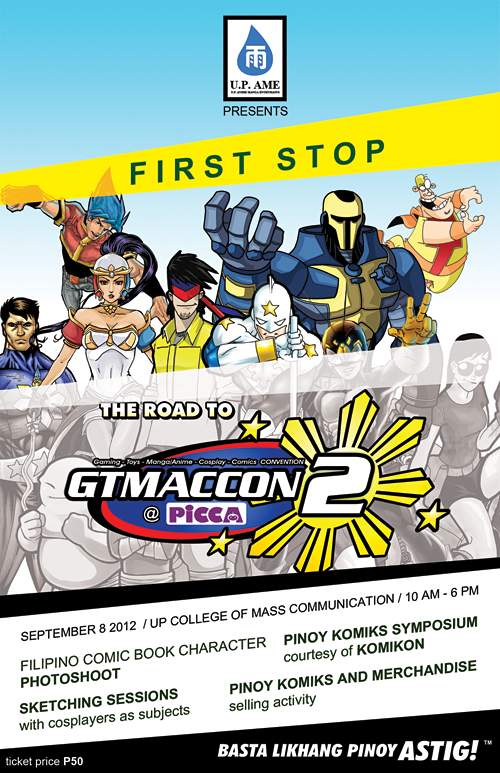 Featuring "Princess Mononoke" and "Origin: Spirits of the Past"
The event features a Filipino comic book character photoshoot, sketching sessions with cosplayers as subjects, Pinoy Komiks and merchandise selling activities, Pinoy Komiks symposium (courtesy of Komikon), and more for only P50! Check out the event page for more details and updates! Meet-ups at Makati or UP Diliman. No biggie, really, but see, I have a couple of gift certificates that I absolutely have no use for, but could possibly be of interest to someone out there...? Sayang lang, I guess, if they end up unused. Fine Print Douchebaggery: Not valid on "block-out" dates and holidays, and may only be availed from Sundays to Wednesdays. The rising wave of Internet spawned popularity, as seen in nico nico douga has arrived in philippine soil. 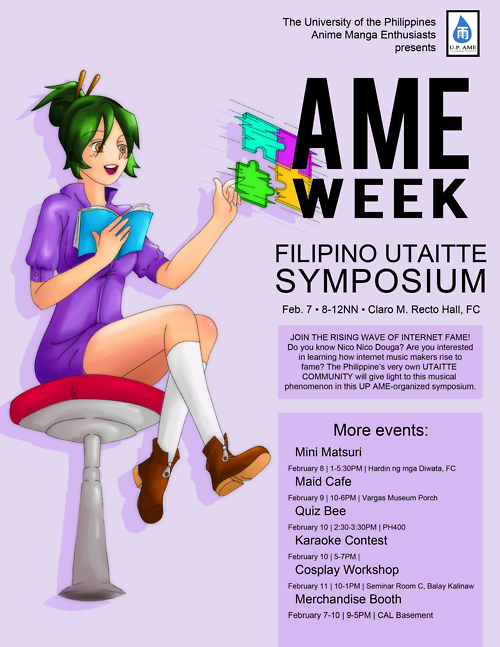 The Filipino utaitte community will give background on the origins, give updates on the development, and give a sneak peek to the future of utaitte mite. From Vocaloid to Nico Nico namahosou it's an event that will give light to this new wave of talent that you won't want to miss. See you there! Please check our Facebook page over here for updates. May be picked up at the Bahay ng Alumni. 1. Kulang pa kasi yung pambayad ko ng tuition this coming sem. Kailangan ko pa ng one whole month na sahod para mabuo so I can only pay sometime December. Pwede ba akong magbayad beyond (normal) payment period? Kasi nakikita ko minsan sa CRS kahit na malapit na matapos ang sem parang may reminders pa sa mga hindi nakakabayad ng tuition. 2. If yes, yung #1, is a letter all I need? Where do I submit it and do I have to wait for it to be approved? 3. How much ang dagdag (interest) if I pay late? Thank you thank you in advance to anyone who will answer. It's hard nowadays to have been born after 1989 aka studying in UP after the 300% tuition fee increase. Join the UP Anime Manga Enthusiasts in the exciting prologue to this year's anniversary celebration - AME Gaiden: A J-Music Concert! 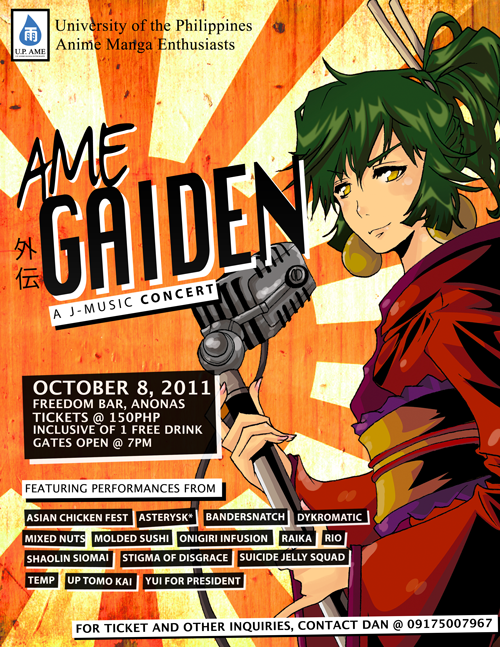 Enjoy performances from loads of Japanese music cover bands this coming October 8 at FREEDOM BAR, ANONAS, Q.C. For ticket inquiries and other information, please contact Dan at 0917-500-7967, or visit the official UP AME website. Tickets will be at the UP AME tambayan at Kubo #2 in the Tambayan Complex in FC! Is it possible to take additional Educ units (for LET taking purposes) after I graduate? If so, may I know how? Please and thank you! Follow this link to sign up for this ACLE. 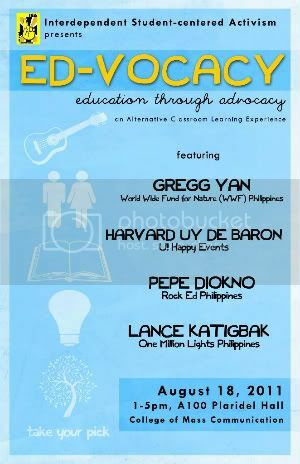 Learn more about how Pepe Diokno of Rock Ed Philippines, Lance Katigbak of One Million Lights, Gregg Yan of WWF-Philippines, and Harvard Uy de Baron of U! Happy Events do it on August 18, Thursday, 1-5 PM at Room A-100 of Plaridel Hall, College of Mass Communication, UP Diliman. A talk on the various means of supporting and encouraging education of the masses on different causes, with speakers who have started scholarships, organizations and activities that not only call attention to the need of a better education and promotion of literacy, conservation of the environment, and campaign for children's rights and welfare, and promotion of nation-building, but have also endorsed their causes in creative ways. Enlist in our ACLE class by signing up here: http://acres.uplug.org/ind​ex.php/classes/details/72. Hey DECL majors! Feeling lost and uncertain about where you can go from here? (Or maybe you just want to know more about your options?) Come to the Career Talk for DECL Majors being given by Armida M. Azada on Wednesday, August 3! 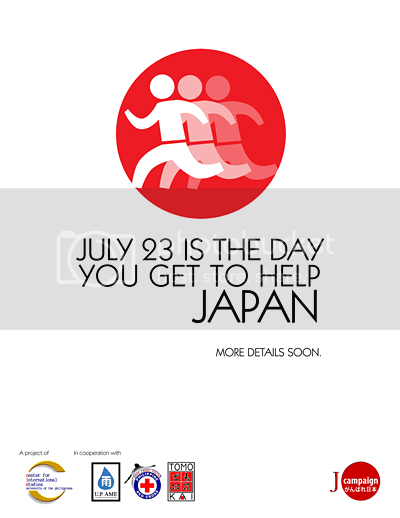 Takbo Para Sa Japan is a project of the Center for International Studies, University of the Philippines, Diliman, in cooperation with the UP Anime Manga Enthusiasts, UP Red Cross Youth, and UP TOMO-KAI. Catch the Canon Photoskwela 2011 workshop in UP. A Basic and Advanced Photography workshop on July 1 and 2 at the CMC Auditorium, UP Diliman. From 2:00-7:30 pm. Priority to Canon Camera holders. Limited slots only. Contact Alisa Baleva at 09175125472 for reservations. 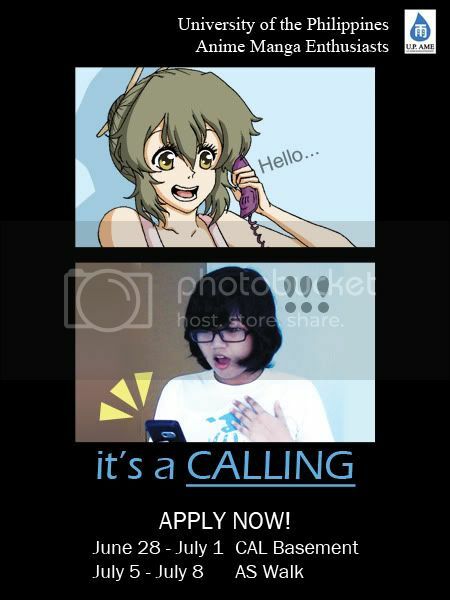 Are you a UP Diliman student who loves anime and manga? Looking to join an organization where you can meet fellow fans? YOU DON'T NEED TO ROAM ANY LONGER! Think you've got what it text? Don't miss this signal. Drop on by and sign up to join UP AME!